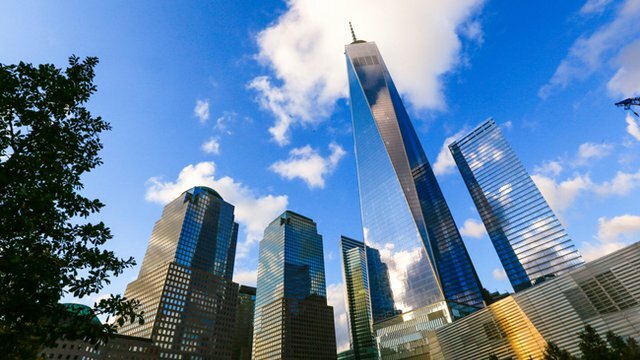 One World Trade Center, built by Skidmore, Owings & Merrill, has recently been awarded the LEED gold certification thanks to its sustainable design. Given its height, and its completely glazed façade, some experts consider the certification an impressive feat. One World Trade Center was completed in 2016, and measures 1,776 feet in height, reports Jetson Green. The number is symbolic and represents the year 1776, which is when the U.S. declared its independence. The structure was built on the spot where the North Tower once stood. The building’s glass curtain wall, which surrounds the building from the 20th floor all the way up to the observation deck, is coated so that glare, ultraviolet and infrared light is reduced, while it allows natural light through, so that it reaches more than 90 percent of the total office area in the building. This greatly offsets the need for artificial lighting, Jetson Green reports. The tower also has a special management system, which monitors and adjusts energy use and indoor air quality via thousands of sensors spread out across the building. Builders also installed a system, which captures rainwater and stores it in three tanks. The water is then used for cooling and irrigation. More than 40 percent of the material used to build the tower was recycled. This includes glass, gypsum boards and ceiling tiles. Also, roughly 87 percent of construction waste was diverted from the landfill. Some 430,000 tons of concrete was used to build the tower, as well as 46,000 tons of steel, but most of the latter was recycled. The elevators, which can move at 2,000 feet per minute are capable of reclaiming some of the energy they need to run through regenerative braking.